NOTE: I HAVE NOT HEARD OF ANY EGGS LAID BEFORE THIS DATE! 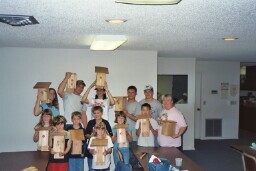 Kids do like to build boxes and learn about birds. - Share with them where you can! One of Ian's Five Bluebird Boxes - He Monitors his boxes from on top of his horse! be available in our area at this time. many are putting up Martin Homes! This photo was taken at a community plant sale in Myakka City. A table with Monitor Guides and this Bluebird setup was on display. This is what our first box setups looked like. I no longer add the 2x3" hole guard on the box. reporting, but should be in use. bring back her Trail. We still hope for her! 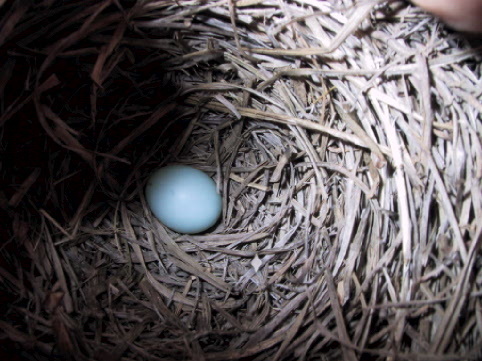 Welcome : This site is created to share our work in Helping to Bring Back the Bluebird in our South Florida counties. One person cannot get this job done, but every individual will make a difference. On the following pages you will find our Bluebird Trail statistics. There will also be photos of our Trail Monitors, and lands, plus other Bluebird Trails found in Florida. We are also starting to help our Florida Bats. A couple of photos show, that the 4-H Bluebird Booklet can be in use, and is now in the works to be published. There should be information which could be helpful to you, and Links to other helpful Bluebird Sites. I hope that you will enjoy the use of this site, ... when you are not enjoying your Bluebirds! Please do Bookmark this site in your Favorites, and visit when you can. Send any comments or suggestions which you might have. IS OK TO PUT UP BIRD BOXES ! DON'T MISS OUT ON A MOMENT OF HAPPINESS AND FUN! The Cuban Tree Frog is a new type of predator that we need to learn about. In the future, I will be putting a photo and information on the site about them. In the mean time do search the Internet to see what they look like and learn about them. This frog is does not have any predators. The Cuban Tree Frog will eat other frogs, toads, lizards etc. 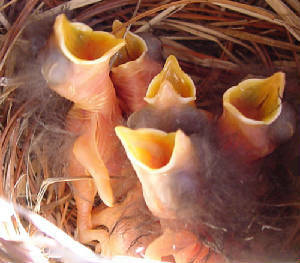 And it will eat bird hatchlings!!!!!!!! What do we do? The experts say to eliminate all the Cuban Tree Frogs you can is what is best. The most humane way to eliminate them is to catch them in a plastic bag and then freeze them in your refrigerator for at least 3 days, and then bury them. Now is also a good time to work on those mounds of Red Ants around your yard. You can make a difference over time as to how many ants you have. Not only for helping the birds, but other animals like your pets, and for your health too, work on this continous problem. Fire ants make mounds, and red ants are seen with a raised ring with a hole in the center. Both give a Big Bite that hurts. Note: Red Ants are a major predator we had on our Bluebird Trails. The photo above was used on the Myakkya Livin' Newsletter. Maynard Sumner, who is on the Bluebird-L, and also the official photographer for NABS in 2008, gave the approval to use this photo. Maynard has since given this photo to me to own, since it represented my first year which was 2002 of me starting with Bluebirds. 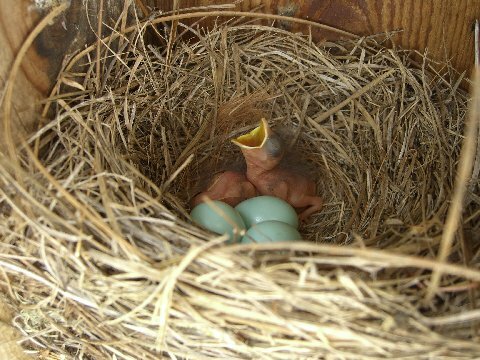 This is a photo which he took of his own Bluebirds. The birds in the photo are about three days old. How do I know? From reading the Bluebird books, and taking a big guess. Guess I could ask Maynard! Thank You so much Maynard. I have now moved to Dahlonega, GA., and now will expand my Project Goals. The first change is getting off of dial up computer, which has made it almost impossible to keep this web site updated. Once on a new provider I will be working on this site more. 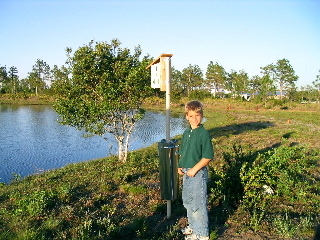 I still will be writing every month for the Myakka Livin' magazine, in Myakka City, FL found in Manatee County and east of Bradenton, FL, as I have since 2002. 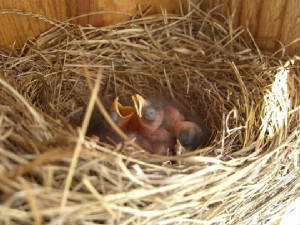 I do hope to promote individual Trail Monitors to use Nestwatch.com to log their own information. With so many Trails/boxes/reports that have usually been giving to me, if individuals will log their own information will free up my time to build boxes, and educate people. Before it was taking me hours to record all the weekly information Monitors reported, and that I then sent to Cornell University. No longer do I have to pay to do this, and it is FREE to anyone to do your own reporting! I also will be giving a little more information to help with the updating of the 4-H Bluebird Project Booklet that is now available for use in Florida. This is the booklet that I first wrote and then the State 4-H turned into a Leader and Student project book. Note: These booklets are going to offered FREE for making copies from the Internet! This also means that anyone in other states can use the booklets. I hope to set up a new work area to start building Bluebird nesting boxes again! I am looking forward to using recycled materials in building. The County of Lumpkin in Georgia has only just over 8000 places of residences, and I have a Dream of putting a box in every yard! Kind of like the saying "A chicken in every pot" There are many who build thousands of nesting boxes, so I believe this is a reachable Goal! This site should be updated within the next few months. If you should see that it has not had any updating is because there may be a problem with the changing of my Internet e-mail address. If I am unable to ever get into this site again, I will start a New Project site. Big News: Where I have moved, has a nesting box, which appears to have been used, and I have seen Bluebirds on this box! 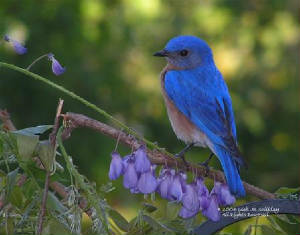 I finally will have Bluebirds too. 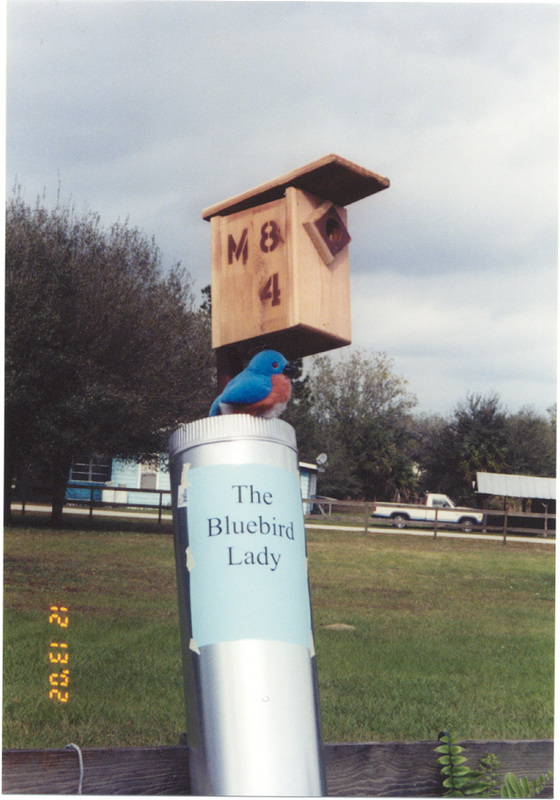 Where I lived in Sarasota, FL on the west side of I 75 I had never had a report of any nesting Bluebirds, but Bluebirds had been reported nesting on the East side of the Interstate! They are coming closer! Plus, reports out east are telling me that Bluebirds are now being found everywhere and in good numbers! People, join the fun and learn easy to learn bird information. 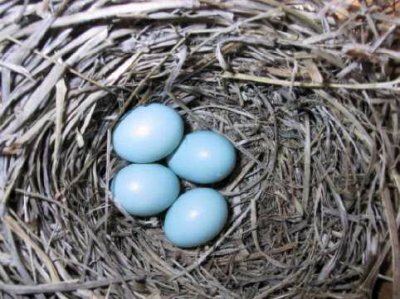 You too can have Bluebirds and other nesting birds in your yard! Get one or more Bluebird size boxes up now!